Beyond the white sand of Ogunquit beach, our village offers fun for everyone to discover Ogunquit’s special places. From exploring the beauty of Marginal Way to antiquing in Maine to taking a Perkins Cove lobster tour, our quaint town has much to offer. Enjoy it all just steps from your room at our Ogunquit hotel and moments from the resort. Ogunquit Maine has many places to enjoy – from family fun to romance.
. . . the white sands of the Southern Maine Coast. Over three miles of classic New England beach with sand, tidepools and the Ogunquit River side for the little ones. Ogunquit beach has been named New England’s best beach countless times – visit our hotel and enjoy. Considered one of the premier beaches in New England, Ogunquit Beach is the jewel of the Southern Maine Coast. Featuring miles of soft white sand and blue ocean water as far as the eye can see, one can easily understand the lore of the beach. Inspiring artists and tourists for generations, Ogunquit Beach goers enjoy tidal pools and surfing, oceanside cafes and trolley service, stunning sunrises and romantic sunsets. A past home to Olympic sail-boarding events and current home to annual sand castle and kite-flying competitions, Ogunquit Beach is the ultimate ocean vacation. A destination for summer vacationers and perfect for walking in the Spring and in the Fall. Uncluttered, immaculate and a vast oasis of white sand, Ogunquit Beach is truly a ‘beautiful place by the sea’. And the best part is the Meadowmere Resort is just a short walk or quick trolley ride away!
. . . the enchantment of crashing waves and seaside Maine cliffs. Maine has long been known for its classic rocky coastline. In Ogunquit, the Marginal Way captures the beauty of the romantic Maine coast. Just steps from our Ogunquit hotel, a gem not to be missed. Enjoy this picturesque path as you walk the cliffs of Marginal Way. Contemplate the ocean along one of the many memorial benches. Mother Nature is at her best – Spring brings sea roses, summer the scents of the beach, and fall the crashing waves upon the rocks. Hidden in between rocky Maine coast and the sea are tide pools teeming with starfish, sea urchins, and creatures of the ocean deep. A gift from the late Josiah Chase and restored by Ogunquit volunteers after the 1991 October ‘no-name’ storm – the inspiration for the movie “The Perfect Storm” – Marginal Way mesmerizes and enchants. The north entrance to the beloved Maine shore line of Marginal Way is just a five minute walk from the Meadowmere Resort. Learn more about the history and beauty at the Marginal Way Preservation Fund website. Come enjoy the beauty of Marginal Way -any time of the year!
. . . the energy of a lobstering harbor and scenic fishing port. Perkins Cove is a place of endless discovery – from art shacks to lobster rolls. Stroll from our Ogunquit hotel to enjoy an evening in the Cove or hop a trolley. Home to one of the only wooden footbridges in the United States, Perkins Cove is a lively scenic harbor in Ogunquit. From classic ocean views to art galleries to Maine lobster, Perkins Cove is full of hustle and bustle in fishing and summer seasons. Perkins Cove began as a small fishing community. Each day, fishermen and lobstermen would head out for the daily catch. One would see sailors and cove men fixing lobster traps, fishing gear, lines and nets along the Cove’s water front. Overtime, those making a living off the sea came to share Perkins Cove with local artists and shop owners – Everyone was attracted by the quaint beauty of this seaside harbor. Today, a vacation to Ogunquit isn’t complete without a trip to Perkins Cove to enjoy the restaurants, shopping and more. Or head to sea with whale-watching trips, lobstering excursions, and deep sea fishing tours that leave from the docks of Perkins Cove. And during quieter times, the Cove is an Ogunquit favorite for ocean dining and peaceful strolls on the Maine coastline. This perfect seaside place is just a trolley trip away from the luxury of The Meadowmere Resort.
. . . the heart of boutique shopping along Main Street. Minutes from our hotel is Ogunquit village center. A classic Maine fishing village full of artisan shops and eateries. Ogunquit’s village area features the shops of the town and is the heart of our picturesque Maine vacation spot. Unique storefronts, candy shops, boutique clothing and more can be found along the historic Route 1, Beach Street and Shore Road. Ogunquit’s Main Street is home to friendly pubs, karoake spots, quaint Maine shops, and Ogunquit’s famous gourmet dining and causal restaurants. 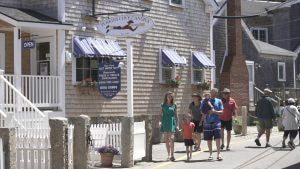 While fishing and lobstering was the main livelihood during Ogunquit’s early settlement, the coastal town is now home to award-winning dining and unique shopping. Sip gourmet coffee, grab a delicious sandwich, indulge in sinful chocolates or have an ice cream treat and walk the quiant stores. Or hit the town at night for dancing, fine dining, and the best of Southern Maine festivals – including art shows, parades and more. Main Street is the pulse of Ogunquit – and only heartbeats from The Meadowmere Resort. Enjoy!